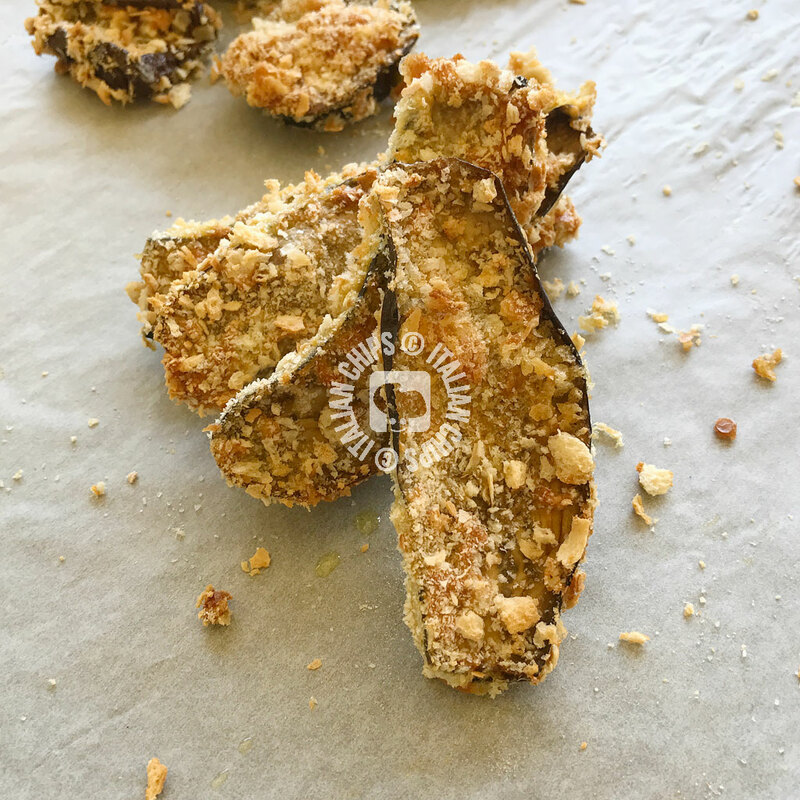 Breaded eggplant is very popular in Italy, especially during Summertime, the plain eggplant season. Most of the time it is fried, as Italian tradition. But even Italians are changing their mind, looking for a healthier way to eat, avoiding fried food as it is usually heavier. I rarely fry. I do like fried food, as probably quite everybody. Fried food is so inviting and so tasty. But I leave it to when I go out for lunch or dinner. At home I try to eat as healthy as I can ;-). That’s why I decided to try this breaded eggplant recipe. I have many other eggplant recipes published here, but I am always open to new ideas regarding how to prepare them. 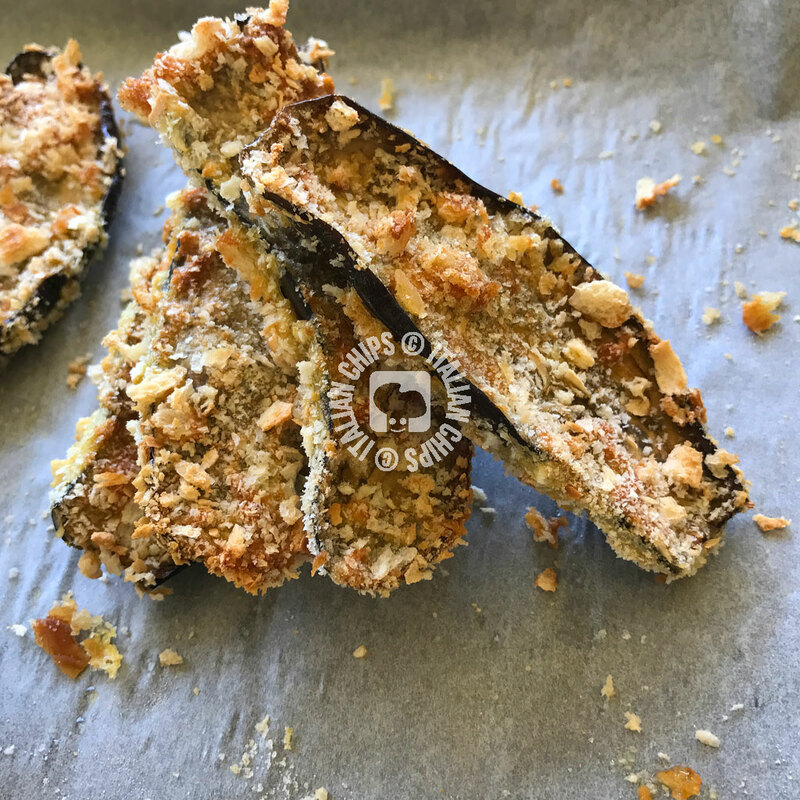 I have found this recipe on the Italian blog Forno e Fornelli and just changed the breadcrumbs to those I prepared myself, instead of the ones we buy at the supermarket. The homemade ones has bigger and irregular crumbs that enhance the recipe. Wash the eggplants and cut the hard parts. Cut them in slices, put them into a colander and salt them. leave them reat a while to eliminate the sour water. Turn on the oven 360°F. Prepare three plates or bowls: one with the flour inside, the other with eggs and the last with breadcrumbs and salt to taste. Take each slice of eggplant and pass on the flour, covering both sides. Pass then into the eggs mixture and then onto the breadcrumbs, covering both sides. Place it on the baking tray. Distribute a thread of extra virgin olive oil on them and bake until lightly golden.